The 7 Steps of Data Analysis Teaching Support Manual & Videos (University License) | StatsWhisperer | Statistics Training, Books, Videos & More! Use the link below to register for The Steps of Data Analysis Teaching Support Tool at 40% off the regular registration fee. Subsequently, the discounted registration rate of $300 will cover the cost of registration and all course materials. As part of this special, instructors who register by April 30, 2019 will also receive 40% off the course textbook (The 7 Steps of Data Analysis) provided to their students for use in this program. Upon registration, you will receive a confirmation email, as well as immediate access to all materials, so you may begin to prepare to utilize them in your upcoming summer, spring, and/or fall semester classes. In short, the materials within this program are designed to help instructors deliver the most powerful and compelling quantitative/statistical research class possible. Specifically, this class not only teaches students how to perform statistical tests, but also illustrates how to arrange these tests into a logical stepwise process that facilitates a legitimate and effective quantitative research study. You might note that these teaching goals are especially beneficial to doctoral students, as the learning would help them meet their dissertation/Capstone requirements. However, these teaching goals for a one-semester course are in no way exclusive to doctoral level classes. Specifically, it could be speculated that the earlier these topics are taught to a fledgling researcher, the more advantageous would be the learning to the trajectory of the scientist’s career. Therefore, the materials within this program begin at a completely foundational level. In other words, the materials within this program are designed to empower students who have little to no experience with statistics and/or research on how to draft a research proposal, conduct a quantitative study, write-up findings, and present the study findings in a powerpoint slideshow. Thus, this program is appropriate for use at the undergraduate, Masters, and Doctoral levels. This program provides instructors with three primary materials to be used as teaching tools. Briefly, instructors are provided with a Support Manual, Video Presentations, and a Textbook that work in tandem to meet course objectives. These materials are discussed in detail below. There are 14 videos within this program. Each video presents the subject matter and learning for each week of the semester. The videos are appropriate for both students and professors to view. Specifically, professors may present these videos directly to their students as an addendum to their class on a weekly basis. Alternately, instructors may also elect to view the videos on their own, as a means of contributing to their lesson plans. 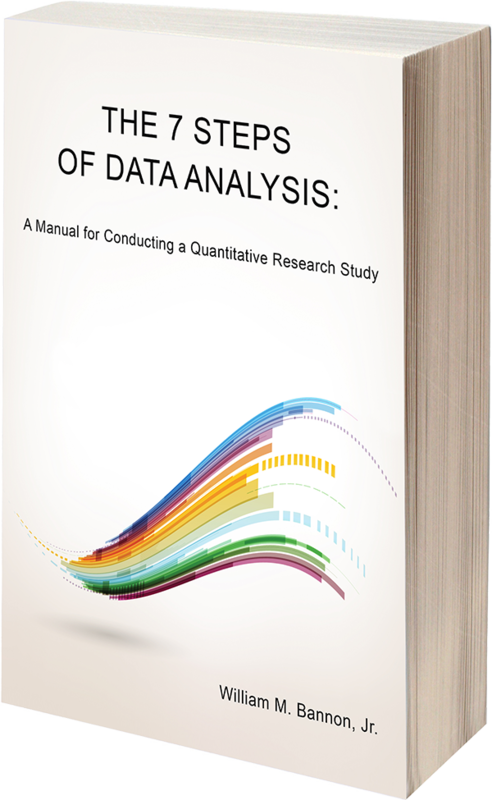 The central textbook suggested for use and listed in the class syllabus is the text (Please Click Title) The 7 Steps of Data Analysis: A Manual for Conducting a Quantitative Analysis Study. This text is ideally suited for use, as the book is written to instruct readers on how to structure and conduct an effective and legitimate quantitative analysis research study. During the current semester, a free copy of The 7 Steps of Data Analysis textbook (Regularly: $122) will be included with registration for this program. Furthermore, as a part of the current special, instructors who register for this program may get a 40% discount off the cost of the textbook for their students. Specifically, students may purchase the textbook for use in the course for $75.60. If you would like to take advantage of this offer please email Dr. Bannon to make arrangements. The syllabus (for an example see: The Ideal Statistics Class Syllabus) specifies that students are taught about quantitative research by directly performing a quantitative research study. In this program, the computer software SPSS is used for such analysis. Sample SPSS databases are provided as a part of this program to be used for quantitative analysis if needed. The syllabus within the manual suggests that grading will consist of 6 quizzes given during the semester to test student knowledge and retention, a class midterm (which is a a research proposal based upon the student’s original research study), and a final (a an original research report/manuscript based upon the proposed statistical analysis plan in the student’s proposal). Registration purchased by the current semester will also include a free 1 hour personal consultation with Dr. Bannon (Regularly: $250). This consultation may concern any topic desired by the registrant from implementing the support manual and videos to personal quantitative analysis research projects.